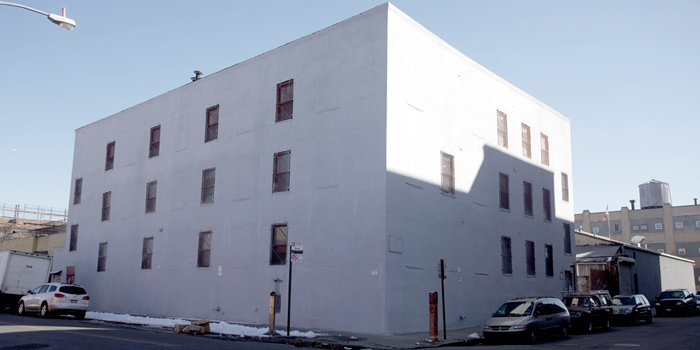 The ACTIVE SPACE is a pro­gres­sive arts cen­ter in the fast grow­ing com­mu­nity of Bush­wick, Brook­lyn. Once a feather factory, this three story 100 year old building was completely gutted to become the new home to thirty seven artists’ studios as well as a new 1600 sf Art Gallery. The Active Space is a green and secure building comprised of affordable, well lit, high ceiling, clean, private studios - designed specifically for serious artists to advance their craft and careers. The configuration, design, amenities and general feel of the studios and building truly provide those elements most important for promoting the creative environment in which our members thrive. The ACTIVE SPACE has become known for this pleasant and peaceful environment, free of distractions and imbued with a strong sense of community and camaraderie of our members. Community is paramount within the ACTIVE SPACE and is what sets this venue apart from other buildings housing artist studios. Artist work within the privacy of their own studios but are afforded the opportunity to collaborate with one another as well as exhibit and plan shows within the space. The ACTIVE SPACE provides a nurturing environment for working artists who rent individual studio spaces. To ensure both high quality work and professional commitment, artists are juried through a supported application and review process. The goal of the space is to provide artists with an exciting, thought-provoking creative environment. Selected artists participate in open studios and other events sharing our process with the greater community of Bushwick. Each studio is private with own locks and keys. 24/7 access and plenty of on street parking. Large communal sinks on each floor. Electronic key card access to main entrance. This process is to make sure that prospective artists are a good match for the space and our community.